Everything you would expect from your professional graphic design software that you can just pick up and take wherever you go, totally free from the confines of your desk. Welcome to your new reality. 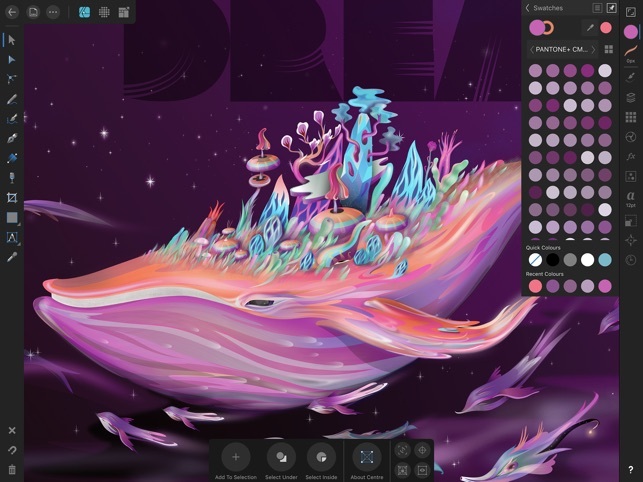 Built with input from some of the world’s leading designers and based on Apple Design Award-winning technology, Affinity Designer for iPad takes all the power and precision of our outstanding desktop app and converts it into a stunning immersive experience. • Metal-accelerated to achieve blazing-fast performance. 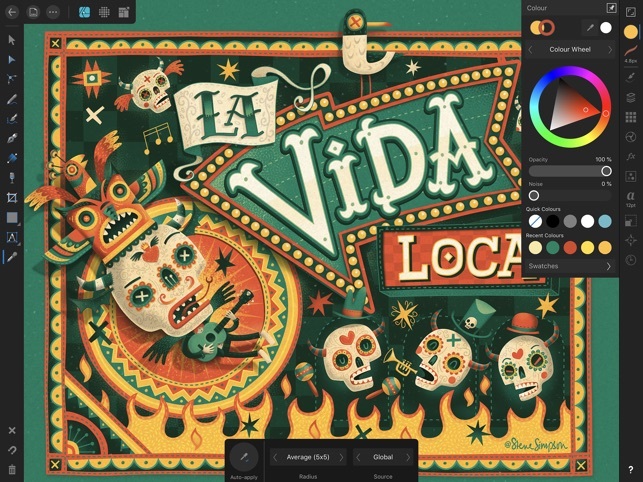 • Sensitive to pressure, tilt and angle, Affinity Designer harnesses the full power and precision of Apple Pencil. • Full iCloud drive integration allows for seamless file management, storage and sharing. • Panning and zooming is always live at 120fps. • Live gradients, transforms, effects and adjustments. 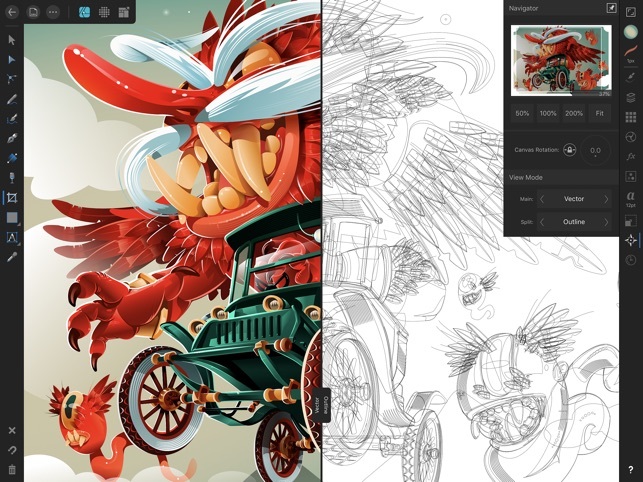 • Live pixel and retina view of vector artwork, wireframe view, split screen mode. 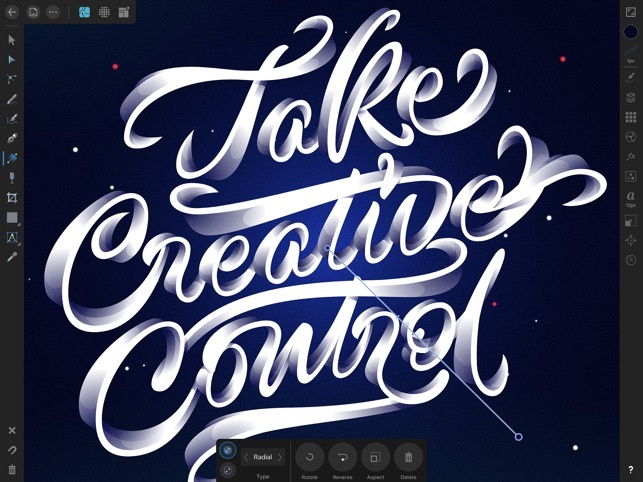 • Seamless switching between tools and editing modes for frustration-free design. • Professional CMYK, LAB, RGB and Grayscale color models. • Full 16-bit per channel editing. • End-to-end ICC color management. • Advanced Lanczos 3 image resampling plus Bicubic, Bilinear and Nearest Neighbor methods. 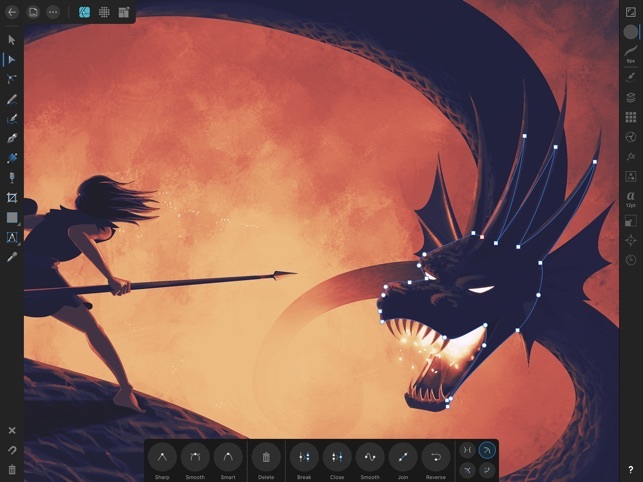 • Rock solid vector tools that work just the way you want them to. 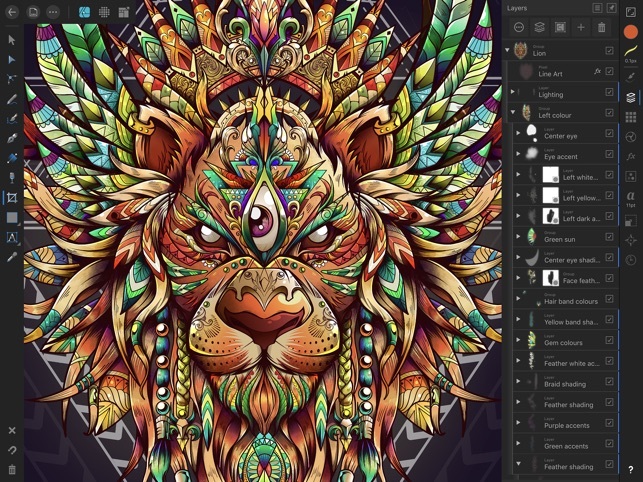 • Live effects, blend modes, image adjustments, and raster and vector masks for any part of your design. • Use the strengths of vector and raster behaviours for the best of both worlds. • The best pen tool, pencil tool, corner tool, curve editing, geometry operations, and smart shape tools available. 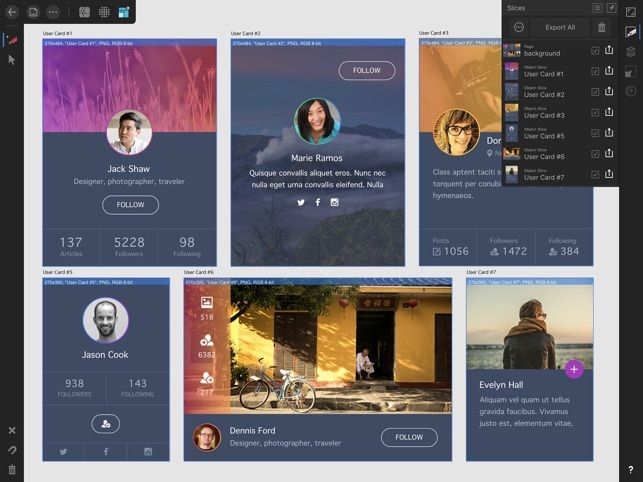 • Artboards, symbols, constraints and stored assets give the ultimate flexibility for UI and graphic design. - Support for new iPad Pro. - Support for new Apple Pencil. 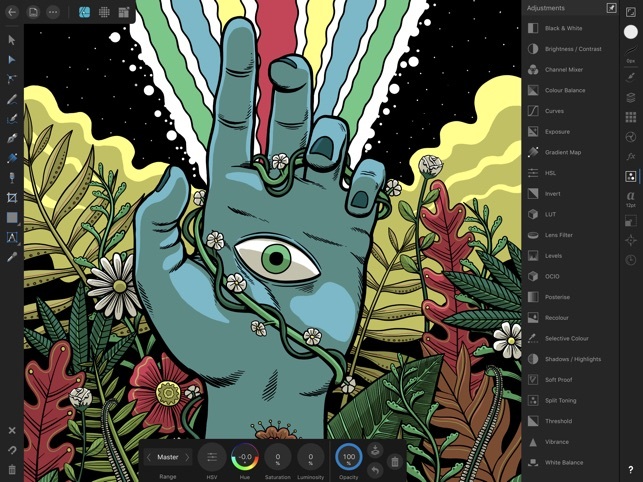 This app makes the iPad Pro the premiere platform for digital illustrators and artists that it was always meant to be. 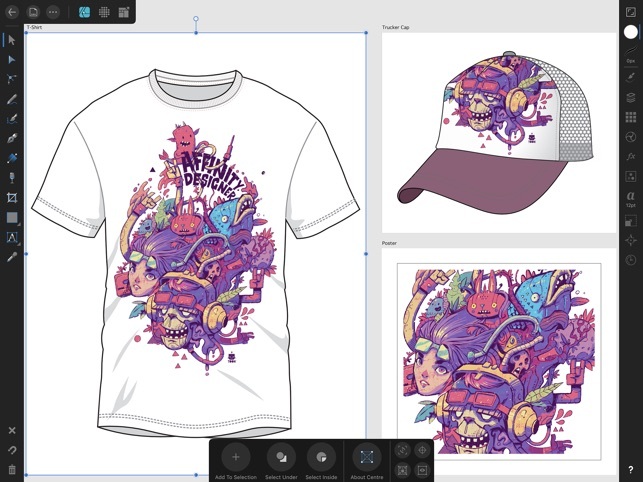 Affinity Designer is a first-rate vector drawing program, comparable to Adobe Illustrator, but carefully designed for a screen-only experience. When combined with Savage’s Procreate (for digital painting) and Serif’s own Affinity Photo (for photo editing), Designer makes the iPad Pro a high-powered studio tool, capable of creating the type of artwork previously only possible on a high-end Mac — but now that artwork can be done in a natural, direct way with a drawing tool that feels like a drawing tool. The depth of this software is really amazing. Out of the box, it allows you to use multiple art boards, layer styles, raster painting (better than Illustrator’s, by a long shot), first-rate text tools, plus a host of other powerful abilities all enhanced by incredible speed and what seems to be infinite or near-infinite zoom. Granted, this is 1.0 software, and I’ll be lying if I said it was perfect. Too many useful tools are hidden behind flyout menus. Zoom to fit, and zoom to 100% definitely need easier access (can I suggest imitating Procreate‘s pinch-to-fit function? ), and while it’s great that you can import fonts, you need to be able to batch import take advantage of the function. Still, this app feels like it’s taken my iPad Pro from 0 to 100 instantly. This is going to change my workflow forever. I have been a longtime Adobe Illustrator user and recently downloaded this app for iPad Pro in a search for a replacement. It was the first app I tried, and I have had a hard time convincing myself that continuing the search is a good idea. Of course the app has some limitations, and there is definitely a bit of a learning curve getting used to where things are and how they work. Once you get going, though, you’ll quickly realize that it’s an amazingly powerful app. I still shake my head in disbelief at its price. I have had one small glitch with placing an image crashing the app, but that’s not a deal breaker for me. The much bigger deal to me has been the clunkiness of some of the gestures. They seem to operate so smoothly in the tutorial videos, but when I use them myself node handles jump around and disappear, and I’m left unsure if I achieved the result I wanted. When trying to constrain size, other things happen, too. It’s a bit weird, but I’m hoping it’s an issue that will be resolved, or that it’s just part of the learning curve and I’ll get the hang of it. All-in-all, this app is super duper powerful for iPad Pro, and I highly recommend. I’m eager to try the Mac version when I upgrade my laptop in a few months, too. 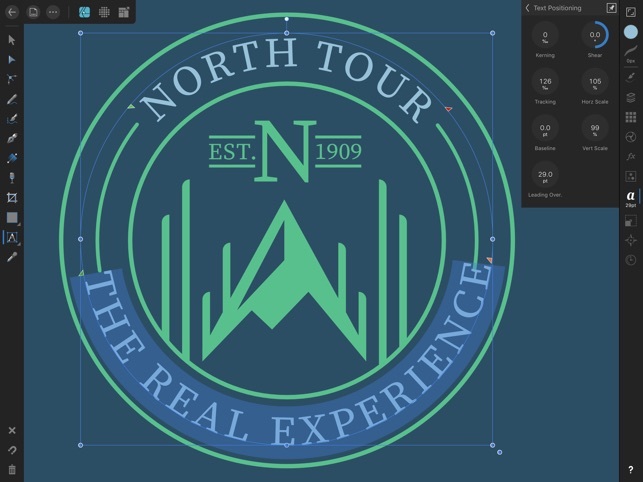 I think my search is over and Affinity Designer is my new go-to design tool. I’ve had Affinity Designer for about 3 weeks now. The ability to switch between Pixel & Vector is fantastic. The ability to use Nodes is a major and important distinction between mobile Adobe Illustrator. The amount of options is a little overwhelming at first but ultimately, this large amount of options built into the interface are incredible and very useful. I would easily give this app 5 stars but over the past few days, the app has not been responding to finger gestures- the interface freezes up and has even crashed the app multiple times without saving several steps prior to crashing. This is a real problem that needs to be solved. While I’m leaving the review, I would like to ask that the lower module at the base of the interface- have an option of releasing it so the options can float closer to the area in-which I am working. It’s a pain to have to always leave the working space to delete a Node or switch the Nodes behavior. Even if the suggestion isn’t possible- perhaps your programmers could make a quick gesture that would make it easier/faster to delete a Node without having to tap the trashcan every time. When working on art in untraditional spaces, like the subway or bus or without a desk- the current configuration is really unpractical. All in all, fantastic app. These are just a few complaints that I needed to get off my chest.